We love horses and we're pretty sure you do too! Why do horses get spooky in windy weather? Why do horses put their ears back? Why do horses always know where the carrots are? Questions like these make us tick. We're in the business of exploring knowledge and the best way to do that is by asking questions. Through our training programmes and magazine articles, we delve into the secret, and not so secret, lives of horses. Learning is journey and we're excited to take you with us. 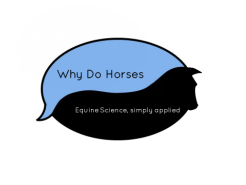 We so committed to developing knowledge and understanding of horses, we've named our business by it. From happy hacker to seasoned competitor, we offer coaching across disciplines in TREC, Pleasure Riding & general riding skills. Want to enhance the lives of horses? ​We've got ideas for all horse-lovers! The Equine Enrichment Workshop is a travelling workshop, so we come to you. Whether you're a small group of friends or a large Equestrian Centre with a host of keen clients, provided you've got the basic requirements, we'll bring along our complete workshop tool-kit. ​To book your workshop, please contact us. Our articles cover a wide range of topics, communicating current Scientific research in an easy to read manner. To see view our portfolio or simply to read our articles on behaviour & welfare, go to the Writing section of our website. If you're looking for us to write for you, please get in touch via the Contact page.